Juan Huang received her PH.D. in internal medicine of TCM at Beijing University of TCM and Pharmacology, Beijing, China. She has been involved in several research projects both experimental and clinical at the municipal and national level in China. Dr. Huang has 20 years of teaching experience both in China and Canada. 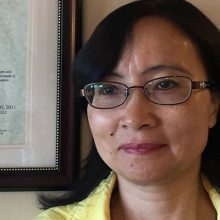 She has been principle instructor at Academy of Classical Oriental Science in Nelson, BC, for 13 years and at Calgary College of Acupuncture and TCM for 3 years. She has taught a broad range of courses from Diagnosis, Acupuncture therapeutics, Herbology, Formula, internal medicine, external medicine, gynecology, Pediatric and classic courses. Additionally, Dr. Huang was a highly esteemed lecturer at the Capital Medical University (Beijing). Dr. Huang has 28 years of clinical experience both in China and Canada, including 13 years practicing both at Guixi municipal Hospital (Jiangxi Province, China ) and Dongzhimen Hospital, which is the affiliated hospital of Beijing University of TCM and Pharmacology (Beijing, China) and 15 years practicing at TCM colleges in Canada. She has successfully treated many difficult diseases in internal medicine and gynecology with acupuncture and herbal medicine. Dr. Huang has numerous articles published in academic Chinese medicine journals.